1. Preheat the grill to medium high. Toss the lamb in the spice mix, then thread onto 4 metal skewers, alternating with the pepper. Spray with a little oil, then grill for 15 minutes, turning frequently until slightly charred and the lamb is cooked through. 2. 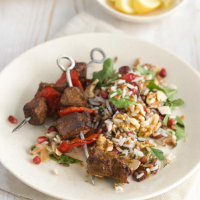 Mix together the nutty rice salad with the pomegranate seeds. 3. Serve 2 skewers per person with the rice salad on the side. Spice blends such as the zatar and baharat suggested here are a great way to add a burst of flavour to meat, fish and vegetables without bumping up the calories. This recipe was first published in Mon Jan 07 16:08:00 GMT 2013.